Despite a strong U.S. economy, historically low unemployment and steady wage growth, home sales began to slow across the nation late last year. This is believed to be caused by a combination of high prices and a steady stream of interest rate hikes by the Federal Reserve. New Listings decreased 6.3% for Residential homes and 9.4% for Townhouse/Condo homes. Pending Sales increased 45.6% for Residential homes and 45.9% for Townhouse/Condo homes. Inventory decreased 24.9% for Residential homes and 20.2% for Townhouse/Condo homes. Median Sales Price increased 13.3 % to $187,000 for Residential homes and 6.5% to $163,000 for Townhouse/Condo homes. Days on Market increased 4.0% for Residential homes but decreased 1.8% for Townhouse/Condo homes. The Months Supply of Inventory decreased 24.0% for Residential homes and 21.2% for Townhouse/Condo homes. 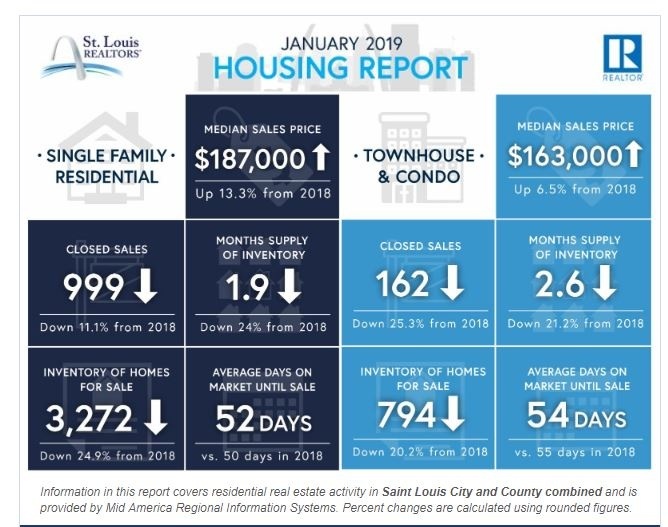 While the home affordability topic will continue to set the tone for the 2019 housing market, early signs show an improving inventory situation, including in several markets that are beginning to show regular year-over year percentage increases.